Honest and popular don't go hand in hand. Last Tuesday, prominent Israeli journalist Amira Hass was arrested by Israeli authorities upon entering Israel from Gaza. Hass, a correspondent for the daily Ha'aretz, had been living and working in Gaza for months, reporting on the lives of Palestinians and revealing many devastating truths about the brutalized and besieged community. Journalists are forbidden to enter Gaza, upon orders from the Israeli military. Clearly, where there are reporters, there may be reports. Where there are reports, there may be knowledge. And when there is knowledge, especially about the Israeli policy of constant aggressive oppression of the Palestinian people, there is sure to be outrage. Truth and dissent are the eternal enemies of history's oppressors, therefore it is no surprise that Israel wishes to suppress knowledge and publicity of its own indefensible actions. 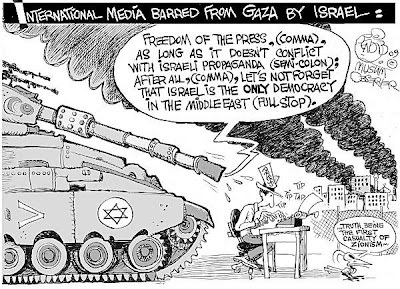 International press organizations have long condemned Israel's media ban. Recently, in November 2008, journalists were prevented from acquiring travel visas required to cross into Gaza at the Erez checkpoint - the only entrance to the territory from Israel. Steve Gutkin, the Associated Press bureau chief in Jerusalem and head of the Foreign Press Association, said that the length of the media ban was unprecedented and that there was no "plausible or acceptable" explanation for the ban. The Foreign Press Association condemned the closure, saying: "We regard this as an unconscionable breach of the Israeli Government's responsibility to allow journalists to do their jobs in this region," further explaining that "the international media serve as the world's window into Gaza providing vital coverage of all aspects of Gazan life to news consumers around the world." "This is Israel's policy, to not show what's going on in Gaza," said Conny Mus, a reporter for Dutch television. 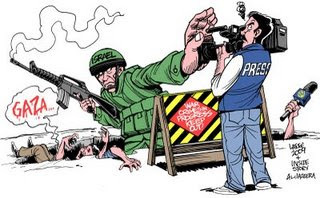 Once the Israeli military began dropping bombs on the residents of Gaza in late December 2008, the freedom of the press to its job was even further curtailed as Israel instituted a complete media blackout. In its attempt to prevent reporters from telling the truth about the massacre in Gaza, the Israeli military defied a ruling from its own Supreme Court that would allow reporters access to the Strip. John Ging, Gaza operations director for the United Nations Relief and Works Agency, agreed: "For the truth to get out, journalists have to get in." In defense of limiting press freedoms, Former spokesman for the Israeli army, Nachman Shai, claimed that full news coverage helps "the enemy," confuses and "destabilizes" the Israeli public. "Today, Israel is trying to control the information much more closely," he told The New York Times. Israel was intent on controlling public opinion based on its own propaganda, a decision made clear by Aviv Shir-On, deputy director general for media in the Israeli Foreign Ministry, who told the Times during the winter bombardment, "We are trying to coordinate everything that has to do with the image and content of what we are doing...We have talking points and we try to disseminate our ideas and message." The Foreign Press Association released another statement, as the Palestinian death toll in Gaza increased horrifically, condemning Israel's restriction of the press: "The unprecedented denial of access to Gaza for the world’s media amounts to a severe violation of press freedom and puts the state of Israel in the company of a handful of regimes around the world which regularly keep journalists from doing their jobs." Controlling the message is vital for Israel and its apologists because it is through this control that, for decades now, the word Palestinian has been nearly synonymous with the word terrorist, and therefore any resistance to colonialism, imperialism, military occupation, and economic hegemony is deemed irrational, unprovoked, inhuman terrorism. By controlling this message, the propagandists are able to pull off an astounding slight of hand on reality: the oppressed becomes the oppressor, the culprit becomes the victim, illegal colonization is cultural liberation, aggressive expansion is righteous reclamation, genocide is self-defense, apartheid is security, and ethnic cleansing is peace. In order to somehow gain legitimacy, the Bible becomes a land deed and the displacement, dispossession, and disenfranchisement of an indigenous population becomes the unhappy, though inevitable, consequence of religious nationalism. Without erasing or ignoring the historical and cultural narratives of Palestinians, Israel cannot hide from the painful truth about its ugly past. This is precisely why, last month, Itamar Shapira, a docent at Yad Vashem, was fired for making reference to the 1948 Deir Yassin massacre and the subsequent Palestinian Nakba during his guided tours. He had pointed out the ruins of the Palestinian village, which can be seen from the grounds of the Holocaust memorial, to a school group. The group's teacher complained to his superiors and his job was terminated. Shapira, a tour guide for three and a half years, told Ha'aretz, "Yad Vashem talks about the Holocaust survivors' arrival in Israel and about creating a refuge here for the world's Jews. I said there were people who lived on this land and mentioned that there are other traumas that provide other nations with motivation...The Holocaust moved us to establish a Jewish state and the Palestinian nation's trauma is moving it to seek self-determination, identity, land and dignity, just as Zionism sought these things." Indoctrination & Education: Who's REALLY Brainwashing Our Children?